Call hotel direct (online reservations do not qualify for group rates): 972-668-9700 and ask for the "Texas Dream Cruise" group. King suites (sleep up to 4 people) and Double Queen Suites (sleep up to 6 people) both available at group rate of $135.00 per room per night. Comfort Suites® is the upscale, all-suites hotel designed to offer you the most comfortable stay possible. Each suite is designed for maximum flexibility and adaptability to meet your individual needs. In fact, that's the idea behind everything Comfort Suites offers. One visit and you'll understand what we mean by "Go Places and Treat Yourself Often ®". Business Travelers, Corporate Meetings, Weddings, Family Reunions, Sports Teams, and a central destination for Frisco's great shopping, dining, and entertainment. Choose from a variety of spacious floor plans: King Suites or two-Queen Bed Suites with spacious living room, work areas, and mini wall separator. Each room comes with a mini fridge, microwave, and coffee maker. Make yourself at home by preparing something in your room. Limited number of Rooms Available, so don't wait! 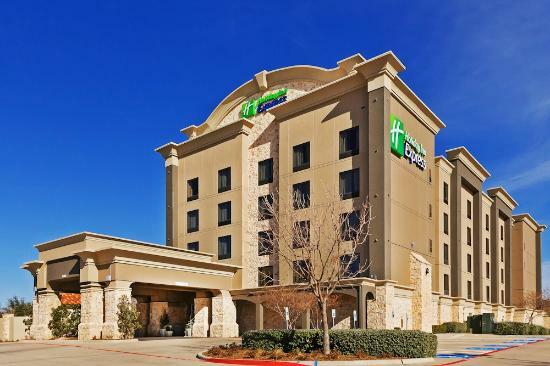 The Holiday Inn Express Frisco hotel is the newest addition to the North Dallas / Plano area. Our central location provides easy access to the Dr. Pepper Ball Park / Arena, FC Dallas Stadium, Strikz, Heritage Museum, Frisco Convention Center and so much more. Downtown Dallas, American Airlines Center, Cowboy Stadium, and Southfork Ranch are just a short drive away. Stroll through Central Park or shop 'til you drop at Stonebriar Mall, The Shops at Legacy and IKEA which provides you plenty of shopping, dining, and entertainment. Business travelers will appreciate that we keep you connected with our free wired and wireless high-speed Internet access, as well as copy and printer services in the 24-hour business center. Dr Pepper Snapple, Ericsson, and Siemens are just a few of the companies that call us home. Relax in your completely renovated room featuring a vibrant new contemporary look and thoughtful amenities, including a 40 inch flat panel TV, work station, mini refrigerator and microwave. If you're hungry, you can head downstairs to our Suite Shop, which is open 24 hours. Enjoy a swim in our crystal-clear outdoor pool or energize in our full cardio Fitness Center. We also offer free parking, free wifi, complimentary breakfast, business center, fitness center and game room. We also have 3 meeting spaces. Each of our guest rooms do come with a microwave and refrigerator, and we are close to shopping and dining throughout Frisco. Whether planning a social occasion or a corporate meeting, our 1812 sq ft of meeting space and outside catering services will make your next event a success. Stay you and stay new with the Holiday Inn Express Frisco. You are able to book your reservation by calling the hotel directly at: 972.668.6011 and ask for the "Texas Dream Cruise" group. Standard King rooms are available at the group rate of $99.00 per room per night with breakfast included. For the traveler open to possibilities, aloft hotels are a modern, fresh and fun destination. With our loft-inspired design and free-flowing energy, you can celebrate your style in the unique openness of a no-walls, no-limits space. See why everyone's all abuzz about aloft, and discover a whole new travel experience. Stay tuned for after event information!